Free, Combined or Total Chlorine… Which Matters Most? That all depends on who you talk to. Most public water systems using chlorine as their primary disinfectant typically try to have a free chlorine residual flowing through their lines all the way to your faucet. Other public water systems using chlorine as their primary disinfectant try to have a chloramine residual flowing through their lines all the way to your faucet. Chlorine Smell Test: In general, water containing only chloramines gives off a much more objectionable odor than water containing a free chlorine residual. 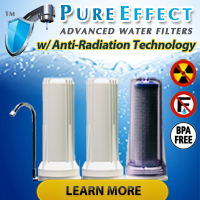 While true that a free chlorine system generates chloramines as the free chlorine gets used up fighting whatever biological contaminants it encounters, the amount of odor given off by those chloramines will typically not surpass the amount of odor given off by water treated solely with chloramines. 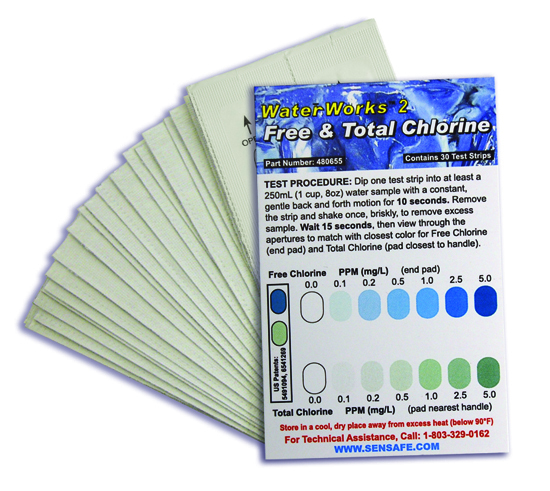 Home Water Testing: While no test strip exists to check JUST the chloramine concentration in water, one does exist to check both the Free Chlorine Residual and the Total Chlorine Residual: The WaterWorkstm 2 Free & Total Chlorine Strip accurately measures both parameters with a single water quality test strip. If the free chlorine test area shows color AND the total chlorine test area shows color, then your water supplier most likely uses free chlorine as its primary disinfectant. If the free chlorine test area does not show color BUT the total chlorine test area does not show color, then your water supplier most likely uses chloramines as its primary disinfectant. 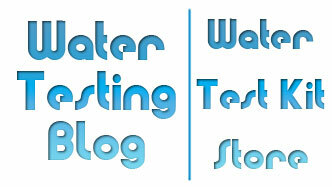 Although the above testing method will yield quality results, calling your local water supplier will get you the same information.